IT has for some time puzzled me that on the same day cinemas from different chains have started screening different films that each in their own way deal with the same theme. The foundation of “Can You Ever Forgive Me?” is the 1980s memoir by Lee Israel who got gazumped when her unauthorised biography of Estee Lauder failed in the marketplace against Ms Lauder’s authorised version. Feeling a tad miffed, because she was indeed a skilled writer, Lee discovered a small goldmine that ended up bringing her before the court on fraud charges. She began a career forging letters from known writers and selling them as authentic to collectors of such prizes. On her path into and through that short-lived career, she found herself emotionally and economically entangled with a gay Englishman who knew a woman needing comfort and encouragement when he saw one. Unfortunately for Lee, Jack Hock had no moral qualities beyond satisfying his own needs. When Lee completed her sentence, she wrote down her life in a memoir that Nicole Holofcener adapted into a screenplay for Marielle Heller to direct. 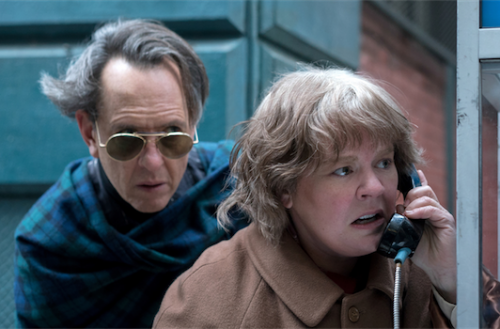 Playing Lee, Melissa McCarthy is a chubby woman whose career thus far has largely depended on comedies that let her give full rein to her quick wit and readiness to take physical abuse for the sake of getting a laugh, even when the material of the film itself had little merit. Lanky Brit actor Richard E Grant with 124 credits in his filmography plays Jack. 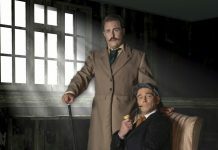 On screen, it’s a low-level tour-de-force for the pair, delivering finely-judged comedy, pathos, wit and mischief in a package that entertains by erecting a dramatic framework that refuses to hurry about proving that crime doesn’t pay.